Mulberry 2-Gang weatherproof outlet box in white color, has 0.094-Inch powder-coated finish and die cast aluminum construction for durability. 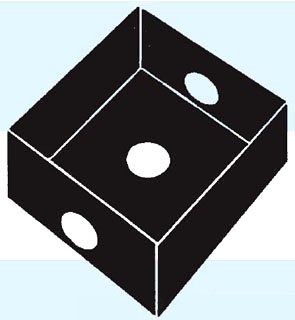 Square box with three hub, has a hub size of 1/2-Inch. NEMA 3R rated box with lug, has a cubic capacity of 30.5-Cubic-Inches. It measures 4.5-Inch x 2-Inch x 4.5-Inch. It is suitable for use with FS, outlet, lampholder or splice box covers. Weatherproof outlet box is cULus listed.